Once you have downloaded the One Stop Order Processing software from the www.1stoporders.co.uk website, there are a few very quick steps to complete the installation. These consist of basic options such as which version you are looking to run and where the destination of the file will be. 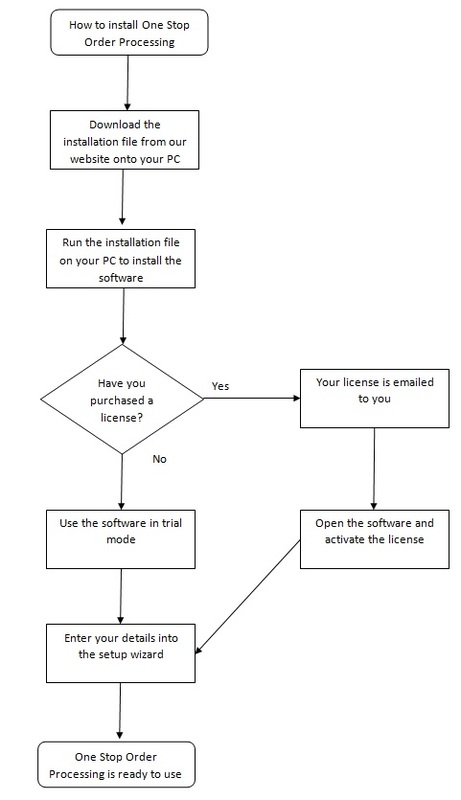 You will then have the option to either start your trial or begin the full version by entering your licence key. If you have purchased a licence you will be sent an email with your licence key within 15 minutes of making your purchase. For help on the steps of installing the software, please click here. Once you have finished the installation steps, we recommend that you complete the Quick Setup Wizard. This allows you to enter in basic information to help get you started. For help on the Quick Setup Wizard, please click here. When using One Stop Order Processing, you may need to backup your settings. Click here for help with backing up the settings. Below is an image explaining the steps on how to get One Stop Order Processing ready to use and installed correctly.